Just another schuli free-heeler. Gery U Photo. 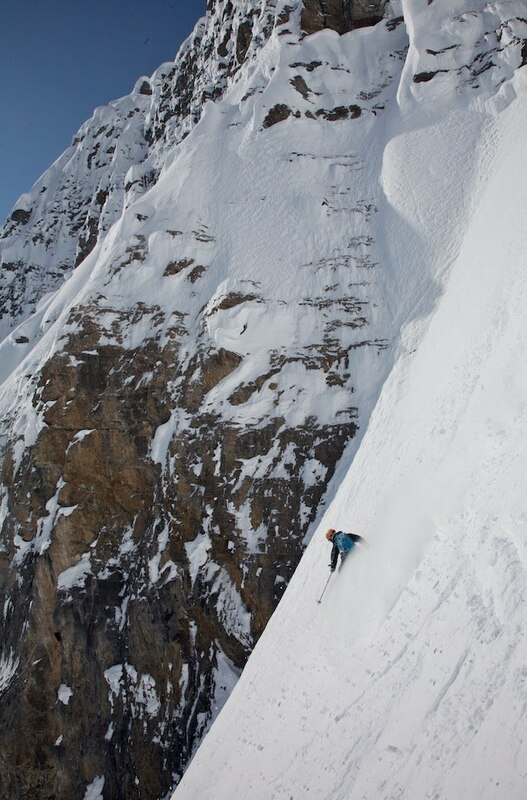 Spent another awesome spring morning skiing on the Icefields Parkway yesterday with Gery U, Ryan C and Fraser S. We left Canmore at the ungodly hour of 4:30 am in order to avoid the heat on the SE Facing Mt. 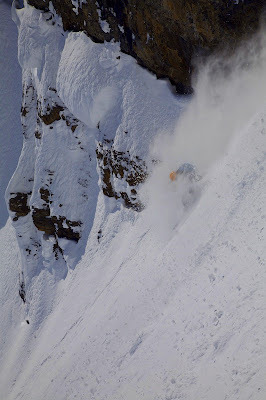 Patterson Couloir. At least that's how we verbalized it the night before. As we all know, the true driving force behind every early morning wake up is not necessarily safety, but the overpowering drive to be sitting on a patio by 1 pm, intoxicated, and spraying loudly about the morning's adventure. The obvious line splitting Mt. Patterson: 11oo+ meters of skinning and bootpacking above the Icefields Parkway. We left the car at about 6:30 am and were standing on top four hours later. Early morning light on the couloir. Ryan, Gery and Fraser on the way up. Gery coming up the final section before the summit ridge. I was a little nervous at this point and wanted another opinion on the slope and the stability. "What are your main concerns?" Gery asked when he arrived at my stance. "Uggghhhh, facets, rocks, shallow terrain..." I answered. But I was not being entirely truthful. What I should have said was that my real concern was being wrong about stability and dying. Gery continuing after the chat. Walking the ridge below the summit of Patterson. 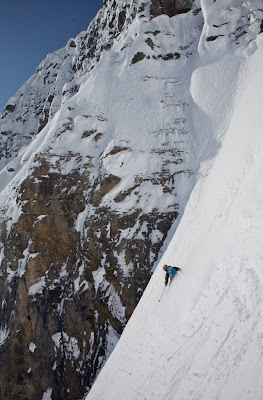 Gery dropping in on the start of the couloir. We had another good exchange moments before he started skiing, when I asked him if he was worried about a buried suncrust. "Ya! Of course I'm worried!" he laughed as he took off down the slope as though it were a groomed super-g course. Gery's split time at this point in the race was 4 seconds ahead of the 2 number racer. Getting in to the main body of the line. I used the photoshop 'powder-correction' tool to make the skiing look really good. I used the powder-correction tool on this shot too. Gery used the powder-correction tool as well as the 'telemark-correction' tool for this shot. This is a great feature that automatically turns a telemark turn in to a proper alpine turn. Gery U Photo. Almost looks like corn skiing.